If you need a sleeved dress, find your favorite style and fit in this collection of sleeved formal gowns and party dresses with sleeves. 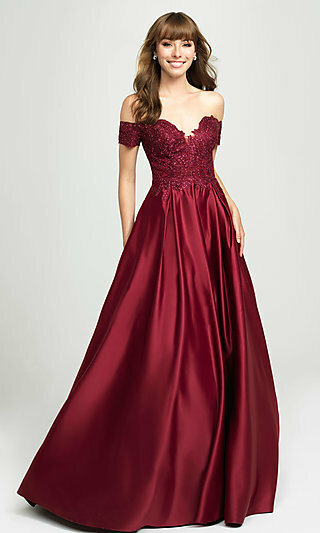 There are cocktail dresses with sleeves and long-sleeve gowns of all varieties. If you are going to a winter wedding, a knee-length dress with sleeves is a classy option that will keep you warm. A two-piece party dress with cap sleeves or a short cocktail dress with lace sleeves is perfect for a girls’ night out. Choose a casual dress with sleeves for a fall festival or concert, or an evening dress with sheer sleeves to set yourself apart from everyone else at a fancy gala or military ball. 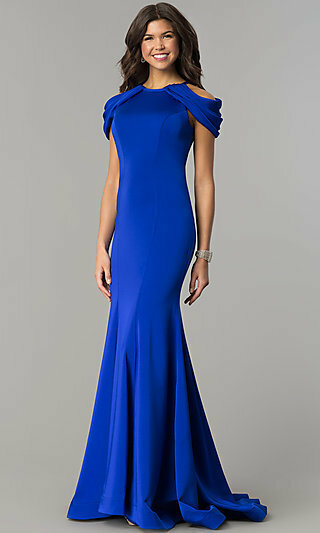 An evening dress with sleeves is the perfect way to add a little modesty or extra style to your look at any event. When Should I Wear a Dress With Sleeves? Wear a dress with sleeves when you need a little extra coverage or want to add a touch of sophisticated style to your look. From the most casual short dresses to elegant evening gowns, this collection has dresses with sleeves to keep you looking beautiful and comfortable at any event. Keep it soft and romantic at a black-tie wedding in a formal gown with long lace sleeves. Bring a glitzy vibe to your next holiday celebration or girls’ night out in a sequined cocktail party dress with ¾ sleeves. Go from office professional to date night without having to change a thing in a fitted short-sleeve casual dress. Cap-sleeved dresses, three-quarter-sleeved dresses and long-sleeved dresses, in a variety of styles and fabrics, can all be found here for any occasion, big or small. Whether you are looking for warmth, modesty, or just more dress to love, a long-sleeved gown or cocktail party dress with sleeves will do the trick. There’s no reason you can’t be comfortable and glamorous when you choose a long-sleeved evening dress. Sheer-sleeved party dresses provide a little extra coverage, while a cocktail dress with sleeves in a thick fabric will keep you comfortable and warm at a winter gala. If you love beading, choose a formal evening gown that will give you even more of the style you love with beading down the sleeves. Whatever your event or personal style, your ideal sleeved gown or party dress with sleeves can be found in this collection.